ESTATE TAX CUT: Democratic leaders of the Maryland General Assembly outlined plans Friday to reduce the estate tax and to offer targeted tax credits to bolster businesses around universities as part of a broader agenda to foster economic development in the state, the Post’s John Wagner writes. The group wants to raise Maryland’s estate tax exemption to the $5.34 million federal estate tax exemption over a four-year period, reports Alex Jackson for the Annapolis Capital. The legislative leaders sent an encouraging signal to Maryland’s private sector when they announced a joint legislative agenda for business and economic development in the state. Agenda action items include establishing a private-sector commission to review Maryland’s support for economic development and creating “reduced tax” zones, a new cyber-seed investment fund and an initiative to develop matching private-sector funding for university research to nurture science and technology industry growth. Donald Fry writes about the plans for Center Maryland. SMOKING AGE: Maryland lawmakers on Monday introduced a bill to restrict the sale of tobacco products in the state to those age 21 and older instead of the current age of 18. If passed, that would make Maryland the strictest state in the nation when it comes to cigarette purchases, consultant Frederick Mattis writes in an op-ed in the Sun. LEGAL POT? ONE DAY: Marijuana will one day be legally available in Maryland. That’s the prediction of the editorial board of the Frederick News Post.. But, writes the board, it won’t be this year, despite a push from supporters and a bill pending in the Maryland General Assembly. Lawmakers become exceedingly cautious in an election year. KIDS HELPING KIDS: Josh Bollinger of the Easton Star Democrat writes that Del. Jeannie Haddaway and Del. Addie Eckardt submitted a Good Samaritan bill into the 2014 General Assembly session that aims to save minors from getting in trouble with the law while also getting kids requiring medical attention the help they need. POLICE SENSITIVITY: Marc Steiner of WEAA-FM hosts Dels. Jill Carter and Michael Smigiel as they discuss bill that would improve police training by provisions including: requiring re-certification for life-saving skills; increasing sensitivity to cultural and gender diversity and others. The proposed law is being called Christopher’s Law in memory of Christopher Brown, a Randallstown teenager who was killed in 2012 by a Baltimore County police officer. REACTION TO STATE OF STATE: Alex Jackson of the Annapolis Capital blogs about the Twittersphere and the reaction to Gov. Martin O’Malley’s final State of the State speech to the Maryland General Assembly, which he delivered on Thursday. He also blogs about state Sen. Brian Frosh and pit bull legislation and the fact that O’Malley will be attending the State of the Union speech. The Sun editorial board Gov. 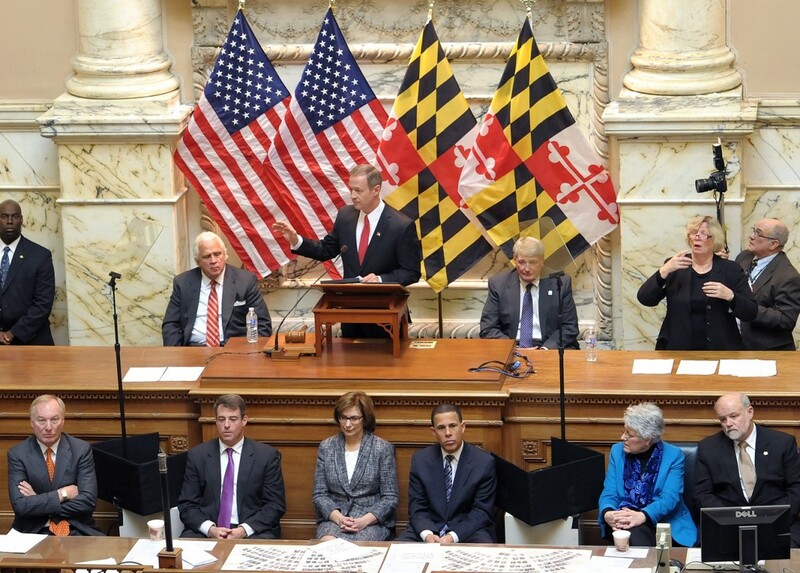 Martin O’Malley’s first State of the State address, delivered seven years ago, gave little hint of the sweeping changes that would take place in Maryland by the time he returned for his final such speech. The main take-away of that speech in 2007 was the new governor’s promise to restore cooperation and civility in a state capital that had seen notable deficits of both during the period of divided government ushered in by his predecessor. The facial expressions of Senate President Mike Miller, House Speaker Michael Busch, Attorney General Doug Gansler, Court of Appeals Chief Judge Mary Ellen Barbera and Lt. Gov. Anthony Brown speak volumes in a published photo taken during the address, Barry Rascovar writes with humor for MarylandReporter.com. BAIL REVIEW: One of the state’s most senior judges said this week that it would not be “realistic” to eliminate money bail in Maryland because the bail bondsmen’s lobby is so powerful, the Sun’s Ian Duncan is reporting. Judge Ben Clyburn, the head of the district court, testified at the General Assembly about proposals to change the early stages of the criminal justice system. ELVIS CARDIN TAKES THE PLUNGE: Charity hurts, as the saying goes. In the case of Del. Jon Cardin, it just hurts other people’s eyes. Cardin planned to plunge for charity in his Elvis/lounge singer costume. He appeared on the floor looking like a cross between an Elvis impersonator and Andy Kaufman’s lounge singer character Tony Clifton, blogged Bryan Sears for the Daily Record. However, the plunge was canceled, according to the Salisbury Daily Times. So, maybe in warmer weather. DUTCH & DELANEY: Political prognosticator Barry Rascovar explains why U.S. Reps. Dutch Ruppersberger and John Delaney will stay in Congress instead of running for governor. Each has his own practical reasons for not taking on that contest. Rascovar wrote the column before Delaney issued his decision. DELANEY TO STAY IN CONGRESS: U.S. Rep. John Delaney, the first term Potomac Democrat, downplayed recent talk that he is considering a run for governor, saying in a statement that his “expectation is that I will continue to serve in Congress,” writes John Fritze for the Sun. DEBATE ON DEBATES: Lt. Gov. Anthony Brown proposed a series of five debates to his two leading Democratic opponents in the Democrat primary for governor. Three of the proposed debates would feature the gubernatorial candidates, while their running mates would participate in the other two, writes John Wagner in the Post. OBAMA TO VISIT PG: John Fritze of the Sun wrote that President Barack Obama will visit Prince George’s County as early as this week to expand on the economic themes he is expected to raise in Tuesday’s State of the Union, the White House said Saturday. PUBLIC FINANCING: Montgomery County Council member Phil Andrews, a candidate in the June Democratic primary for county executive, is preparing to introduce legislation that would establish the Washington region’s first system of public financing for local elections, reports Bill Turque for the Post. Andrews said he sees public financing as an essential counter-weight to the influence of special-interest money in Montgomery elections, primarily from real estate developers and public employee unions.